Back on May 2, 2009, a bunch of us old time Humble and Fred fans got together at a Toronto pub to witness the recording of the 20th Anniversary Podcast of Memories. And lo and behold, here it is! It's a couple of hours long, and over 100MB, so be gentle. 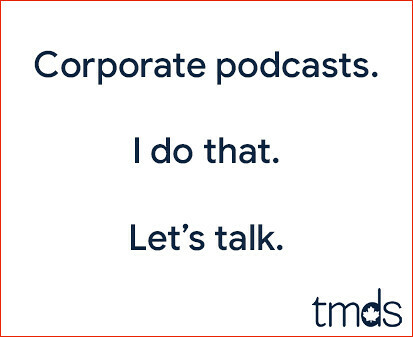 The home page for this podcast, should you want to subscribe to the podcast in iTunes or stream the MP3, is https://www.torontomike.com/humbleandfred/. Thanks to Acme Pictures for donating the web space and Dan Duran for producing the audio. Oh yeah, and thanks to Humble and Fred for two hours of great radio audio. If you have any questions or issues playing this audio, leave a comment below and I'll get on it. 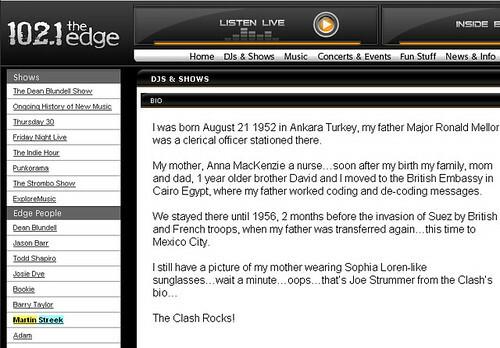 I listened to CFNY (Edge 102) throughout the 90s. It was my favourite radio station, not just for the tunes but for the personalities. I can't remember a time at 102 before Martin Streek. Martin Streek always seemed to be there, hosting the Thursday 30 and live-to-air broadcasts from various Toronto clubs. Now I've learnt from @scroll on Twitter that he's been fired. The first thing I did when I heard the news was visit his profile page on EDGE.ca. It's been removed. Here's the cached version from Google. Martin Streek is another of the three remaining personalities from the "Spirit of Radio" era. He currently hosts the Thursday 30, a four hour long show that counts down the top 30 songs of the past week (collected via record sales and listener voting), as well as introduces new music (a segment called the "Groundbreakers"), and flashes back to a previous year's countdown, as Streek recalls the top five songs of that week in a certain previous year. Streek also hosts two live-to-air broadcasts from nightclubs: Saturday nights at the Phoenix and Sunday nights at Velvet Underground, both in downtown Toronto. Both shows run from 9:00 PM until 2:00 AM, and are broadcast without interruption (i.e., commercial-free), except for live ads imploring people to visit the club, after about 10:00 p.m.. Martin is also a huge fan of Nine Inch Nails, Tool, Depeche Mode and The Clash. Martin has been voted DJ of the year a few times in Now Magazine's year-end public ballot. Just recently he had to have his appendix removed surgically; he has recovered and is doing well. Martin Streek, if you're out there, let us know where you're at. You've been a familiar voice over Toronto airwaves for about 20 years and you'll be missed. Update: I see another name missing from the personalities line-up. Barry Taylor is also missing and his page at Edge.ca has been removed. Can someone shed some light on the disappearance of Barry Taylor and lifelong CFNYer Martin Streek? Below are the top 102 songs of 2008, according to 102.1 The Edge. I threw down my personal top 10 right here. My tunes ranked 72, 62, 25, 10, 19, 67, 40, 36, n/a and 22 respectively. That n/a is for "Inside the Cinema" by Culture Reject which, unfortunately, never got a sniff from CFNY. I'm not sure why as it's an awesome, addictive tune by a Torontonian, and would have been a great add. 13. Against Me! - Stop! 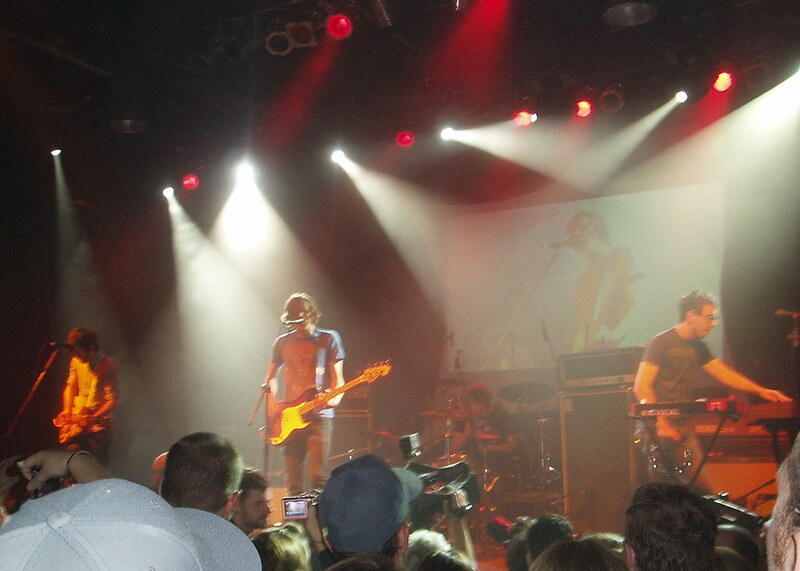 The Kool Haus provided an intimate setting where I could get super close to the acts without fearing for my life. This is a good thing as I'm no longer the young man I once was. In fact, it's fair to say on this night I was one of the few people over the age of 30. The set-up was great, with two stages going so there was minimal wait. It was one band after another with a few awards handed out and some video montages from the Edge personalities, most of whom hit the stage at one point or another. And yes, there was an appearance by Strombo. I saw seven bands, and here's a bit about each performance. Die Mannequin got to play their big radio hit and then their next radio hit and they did so while mired by technical problems. As the ballsy lead singer chick said, "help us out here, we're string-less". I know it was only two songs, but it was a fun two songs. I really like these guys. I'm a sucker for the wheels of steel in rock, or the 1's and 2's as I've been told the kids now call them. They cleaned up tonight, winning a couple of awards. Here's a little USS I stole with my dusty old Olympus. I dig these guys, too. They actually played three songs, including their smash hit from last year. I grabbed a little video of that. This guy reminds me way too much of George Michael. I don't know if it's the beard or the hair or the earrings or the voice or all of the above. Without their guest vocalists, this ensemble does nothing for me. I was hard on these guys when they first hit a couple of years ago, but I'm starting to think I had them all wrong. I mean, what's not to like? They played three big radio hits and had me singing along. Here's a little BS for ya. Yes, I spin the two City and Colour albums constantly. Yes, they are rather melancholy and slow, but I think they're sweet. Here's Dallas Green singing my favourite song from 2008, sans Gord. Sloan are now grandfathers of new Canadian rock. They actually got to perform four songs, and closed with Money city Maniacs, a true Cancon classic. Unfortunately, the battery died on my digicam. It was a great night of music. Breaking news... I just heard Guns N' Roses on Edge 102. 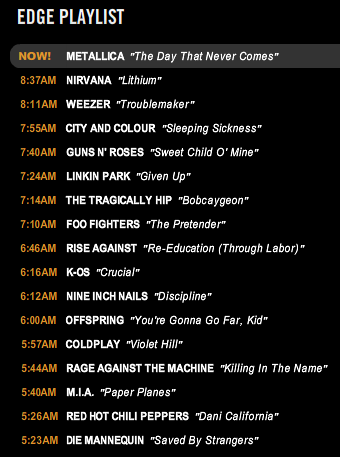 You'll see "Sweet Child O' Mine" was played at 7:40am. I remember when CFNY first played Metallica. Is this another shift in the space-time continuum? I was listening to a little 102.1 this morning. I know the morning show there is brutal, but for some reason I like hearing Linkin Park's "Given Up" every morning on my way into the office. Judge not lest thee be judged. So I'm listening to the tunes when the guys come on to talk about Sausage Fest. Jason introduces the plan as a way to celebrate the fact The Dean Blundell Show is the longest running morning show on Toronto radio. There's only one problem with that statement. It's one big fat lie. The best morning show in the city, in my humble opinion (no pun intended), belongs to the man who currently holds that title. Andy Barrie has hosted CBC Radio 99.1's Metro Morning since 1995. That's about six years longer than The Dean Blundell Show has been on the air. On edge.ca, they were smart enough not to put that lie in print. Here's what you'll find over there. We're throwing a party to thank you for all your support, and can’t think of a better way to say thanks than by giving you some sausage. On August 15th at Polson Pier, it's the first annual Dean Blundell Sausagefest! We’ll be cooking up some delicious, juicy sausages for some lucky Inside Edge winners. We’re hooking you up with some sweet tunes as well; Die Mannequin, The Saint Alvia Cartel, The Flatliners, and The Salads will all be playing live! So if you want in on a day of fun in the sun, some great bands, and of course some sausage, listen to win or enter now to win access to Dean Blundell's Sausagefest for you and a friend. Brought to you by 102.1 The Edge. Damn, even typing sausagefest makes me feel like a 14 year old kid.